My children and I attended the Hudson Library and Historical Society Ohio Author Day and Book Fair last April in Hudson, Ohio. It was exciting to see many people from the community supporting their local authors. One of the authors we met was Suzanne McGinness. She shared her birthday with us while we admired the original artwork in her portfolio from her first book, My Bear Griz. I was so happy that the library organized this event. It gave my family the opportunity to meet a very talented picture book author and illustrator, see her artwork up close, and have her sign a book that we will cherish every July for many years to come. Suzanne McGinness graduated with a Master of Arts in Children's Book Illustration from the Cambridge School of Art at Anglia Ruskin University in England. 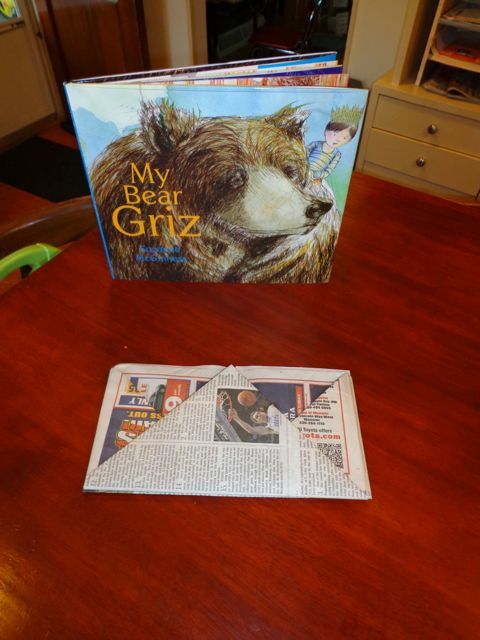 She debuted as a children's book author and illustrator with her picture book, My Bear Griz which received the White Raven Award 2012. Additionally, she was described as "a talent worth watching" by Publisher's Weekly. On her website she states, "I draw from my surroundings as well as day to day experiences, capturing those small memories from life's passing moments. This impact of memory to hand creates the release from which characters form and situations develop." At the local author fair, I was drawn to the book My Bear Griz as it sat on a table among other books for sale. 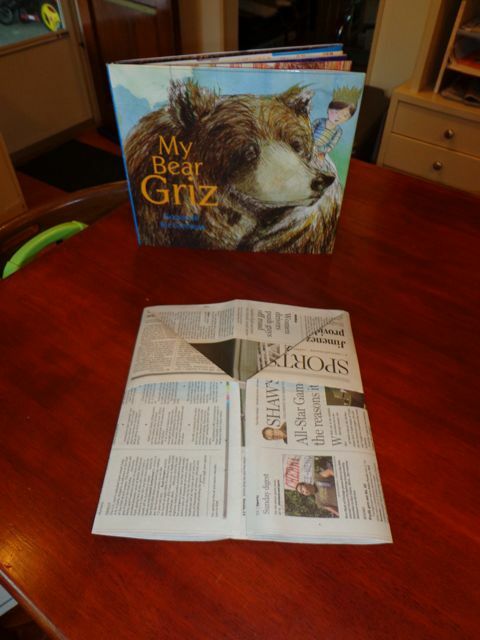 It is physically large, measuring 10.5" and 12" and the grizzly bear on the front cover is enormous taking up almost all of the space. Little Billy manages to peer over the grizzly bear's head wearing a paper crown. Upon opening the book, you meet Billy and find out that he loves bears especially his bear, Griz. 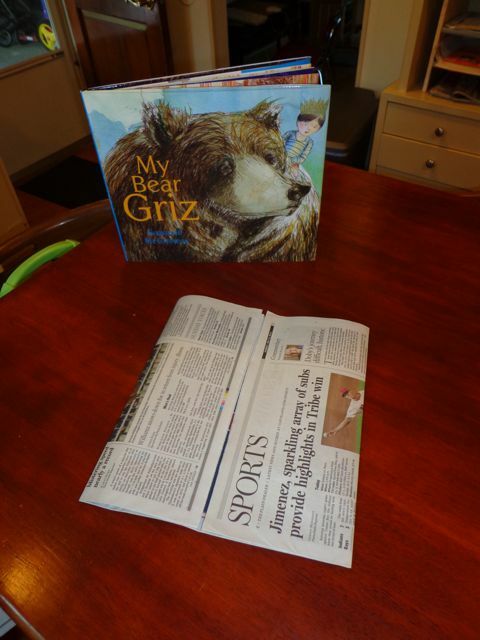 This book highlights the important role a stuffed animal can play in a young child's life. My family and I read this book about ten times over the course of the week. The illustrations are stunning, the text is simple, and my children connected with it immediately. Our birthday celebration activity for Suzanne McGinness began with making a paper crown just like Billy wore in My Bear Griz. 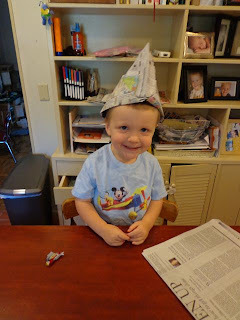 At the bottom of this post, I did my best to show how to fold a paper crown using just one sheet of newspaper. As with all origami projects, it was initially tricky to make the crown, but after making a few for my boys it became easier. 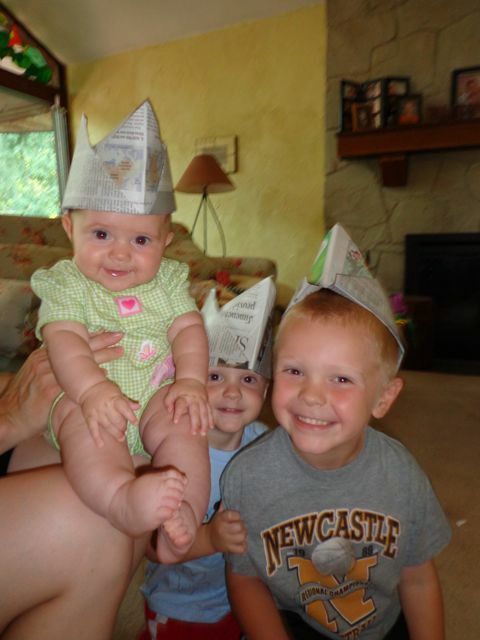 My boys thought these crowns were so cool! 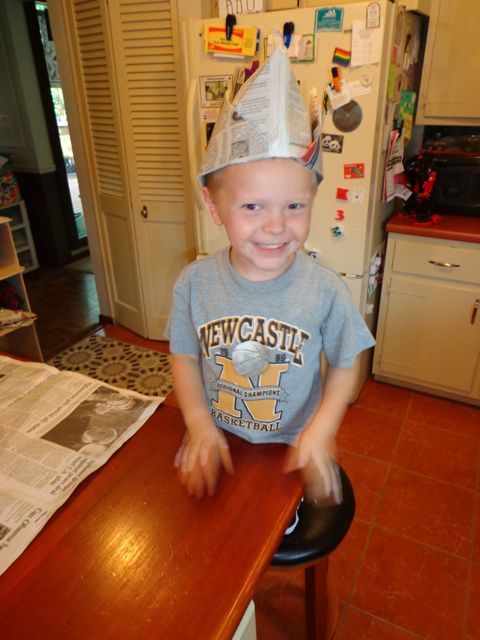 My four year old went through three crowns. Two tore at the seams, probably because he has such a big head! 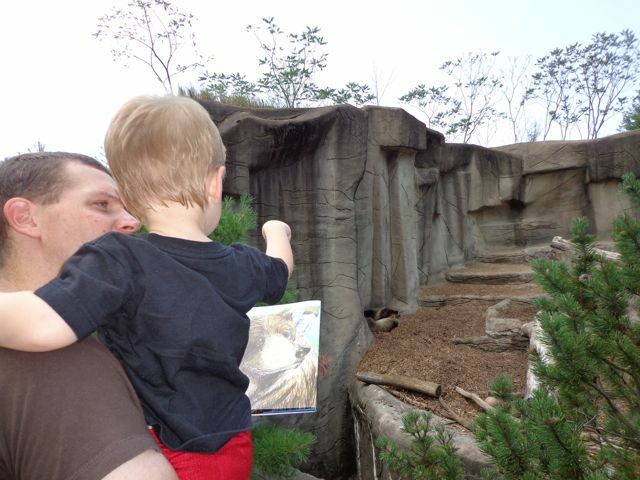 The other one got all sweaty at the zoo! But, he insisted on wearing a crown all day! My son had the idea of making a smaller crown for our young princess! 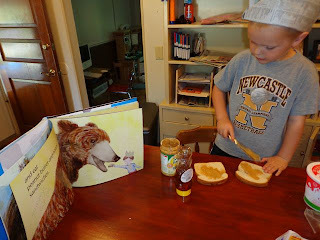 After making our crowns, I told my son that we needed to make peanut butter and honey sandwiches because we would be heading the Cleveland Metroparks Zoo to visit the grizzly bears. In the book, Griz and Billy love peanut butter and honey sandwiches and so do we! Once we arrived at the zoo we went directly to the Northern Trek where all the bears live. We saw spectacled bears and sun bears. 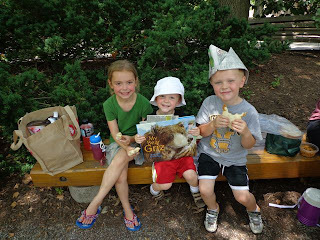 Then, we got out our peanut butter and honey sandwiches for lunch because we knew that the grizzly bears were near. 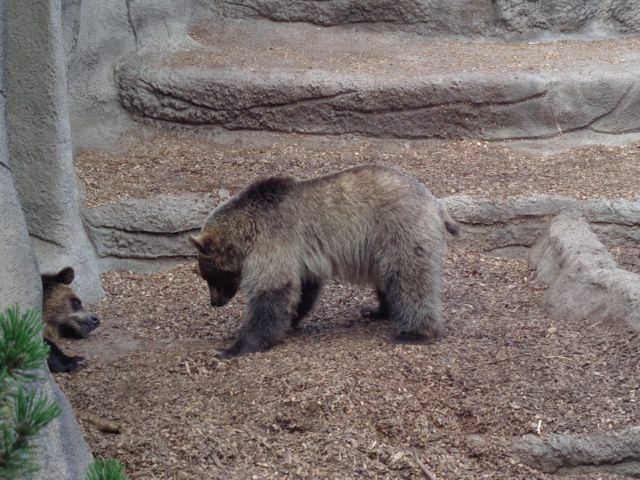 Right around the corner, the Cleveland Metroparks Zoo had three grizzly bears on exhibit. Two of them were young cubs that were born February 2011. Of course, I wore my paper crown throughout the zoo too. My daughter did not, but she said, "I will wear a crown for the picture." What a good sport! 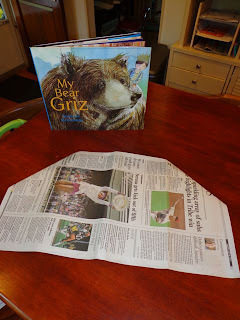 My two year old son made a connection between Griz from the book and the grizzly bears that live at the zoo. Nap Time! 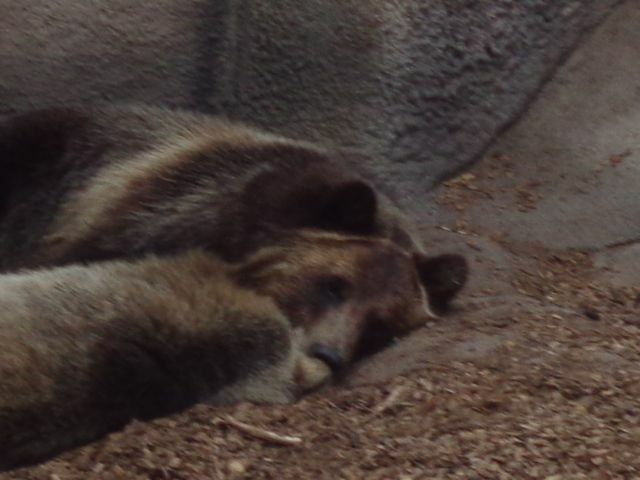 Just like we learned in the book, "Griz is great for taking naps." 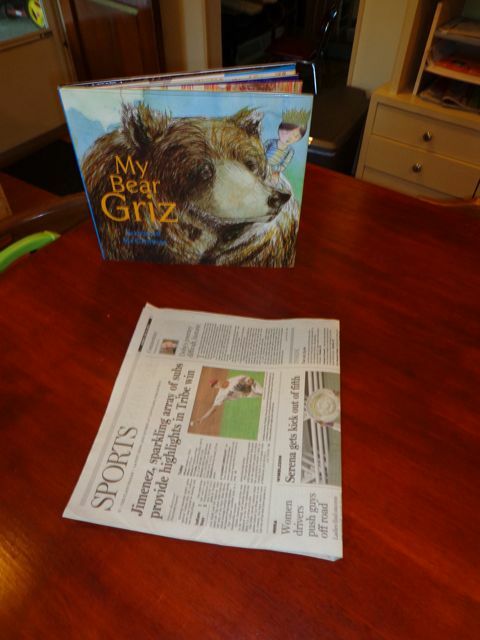 After our experience this week with My Bear Griz, I would agree with Publisher's Weekly that Suzanne McGinness is a talent worth watching. I am very eager to see another book from Suzanne. Start with one sheet of a two-page spread from the newspaper and fold in half. 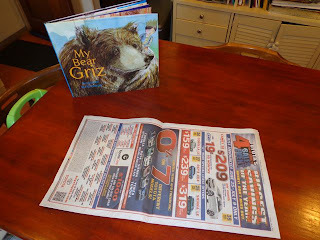 This is easy because the newspaper already has the crease. 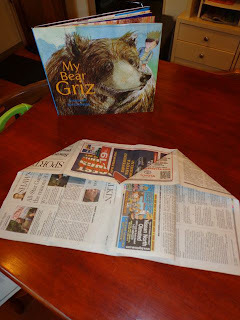 Then, fold the newspaper in half again and then unfold. All you needed to do was make the crease in the center to guide the next step. With the crease you just made as center, fold the right hand edge to the center. Then, fold the left hand edge to the center. Unfold all the folds except for the first fold. Now you have creased the newspaper to make four columns. 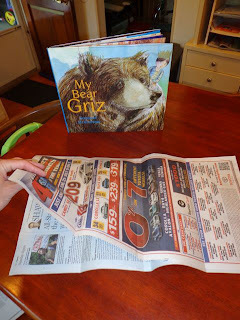 At this time, make sure the opening of the folded newspaper is at the bottom or closest to you. 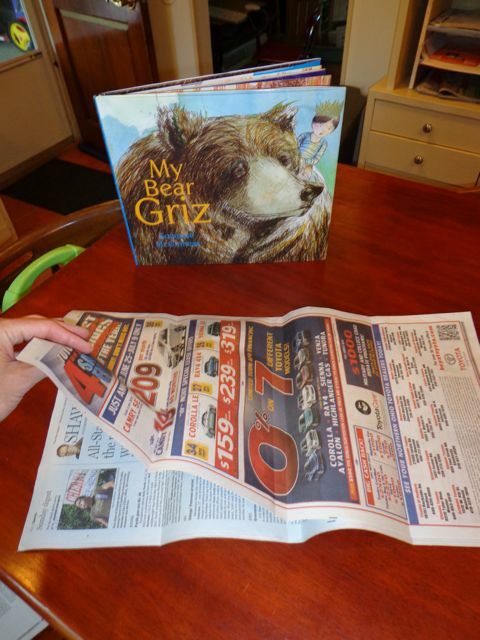 Next, flip the newspaper over. 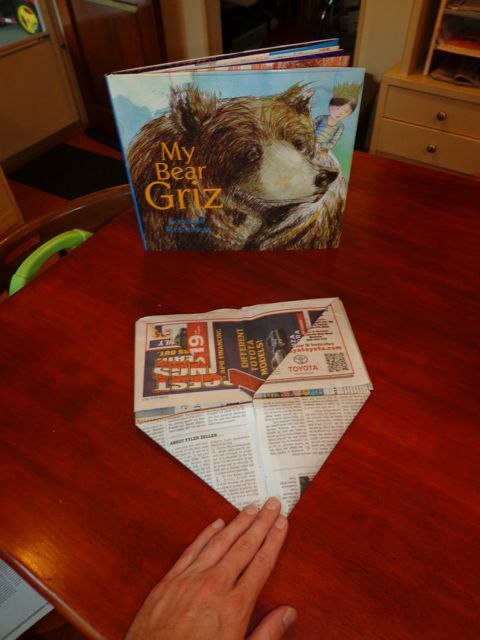 Fold the left and right edges to the center. Now, fold the bottom left and right handed corner to the center of the paper. This will make a triangle at the bottom. 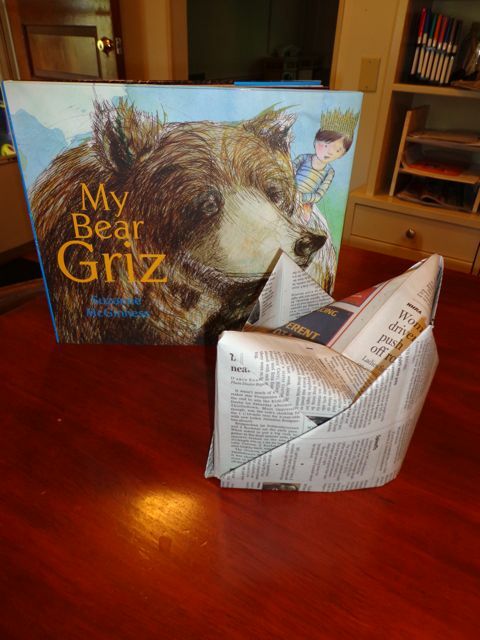 Fold the triangle up to the top edge. Flip newspaper over and repeat the above step for the other side. Your crown is complete. Open and enjoy. 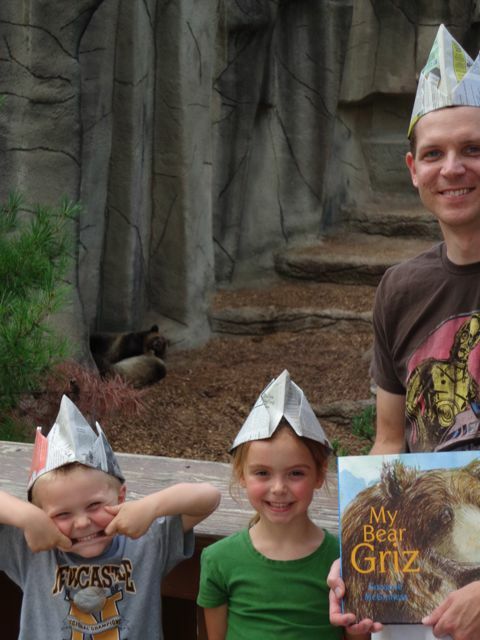 The illustrations in this book are stunning, but your adorable kids in their hats take the cake! Thank you so much Iza! 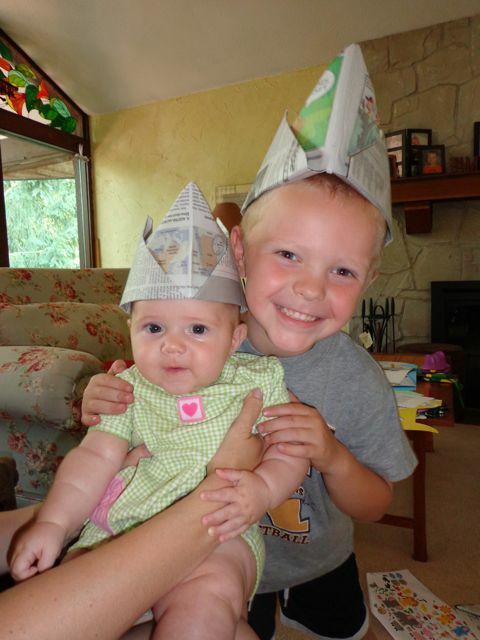 I can't believe what a hit those hats were. As always, Eric, your feature delights! Sounds like Suzanne is a very talented author/illustrator.